Nine years ago I was a single mother with a 4 year old little girl. She was and still is the center of my whole world.... I worked 2 jobs to make ends meet, but we had a very very happy life. A man came into our lives that soon changed all of that. Over the next few years, he was very abusive, both mentally and physically. It all came to an end one night when he got abusive towards my daughter on her 8th birthday. I knew that this wasnt the life I wanted for myself nor my little girl. A month later I found out that I was pregnant by this man. Throughout my pregnancy I lied to him and told him that it wasnt his child. Eventually the pressure from his many apologies and heart-filled efforts, my guilt got the best of me and I gave in. My daughter and I moved in with him, and I had high hopes that this time would be different, being we had a child on the way. I gave birth to a wonderful little boy and for a while things were better. But, it didnt take long before he became violent again and started using our son against me. Our last bad fight was over my daughter bringing a puppy home in hopes we would allow her to keep it. Once again something so small set him off. My daughter and I both caught physical abuse from this man. I had enough! I was down to 98 pounds and had absolutely no fight left in me. I packed a bag of clothes for me and my children and went to stay with my sister. I soon found a small apartment that became home. I found a job and slowly made that apartment a home. It wasnt much, but it was safe, and me and my babies could finally begin to heal. After a year I decided maybe it was time to date again. I dated a few men, but after all my kids and I had been through I was picky and very cautious when it came to love. Then one night, I get a call from a guy that I had met years before, asking if he could take me out some time. I said yes. When he came to pick me up, he had flowers. He opened doors for me and had a certain glow about him that just made my soul smile. At this time in my life, I found out that I was battling cancer. I explained to him that if he wanted to walk away, now would be the time to do it. He cried and told me that there wasn't anywhere else he would rather be. Over the next few months we spent time together, and I was starting to see that maybe his intentions were genuine. It wasn't long before he started asking to meet my children. They had been through enough, and I wasn't about to allow anyone else to hurt them again. I put it off time and time again. I tested his patience, but eventually said I'd give it a shot. He met my 13 year old, and she instantly fell in love with him. Not long after, he met my 4 year old son. He took us fishing :) so needless to say he won my son over right away. He asked me to marry him shortly after meeting my babies. We got marrried quickly, and I havent looked back or had any regrets since. He knew where me and my kids had been, and he knew that it was going to be a challenge to be part of our lives. He didn't let that stop him. He is truly my best friend and soul mate. What was so broken in me before was finally whole again. Me and my kids finally feel safe and loved. He refers to my kids as his daughter and his son. He's held my hand and been an amazing support system thru my illness and many surgeries that have finally left me cancer free!!! When I left my son's father, I had only a bag of clothes and 12 dollars in my bank account. But two years later I have managed to build a beautiful life for me and my family. 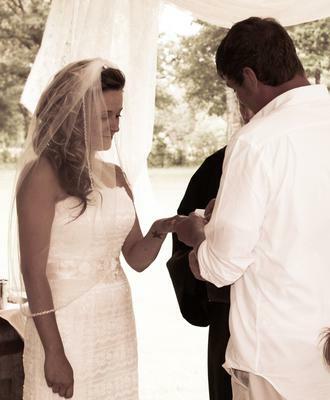 I married the man that God made for me. It was a hard road but was well worth the blood sweat and tears because it led me here. Take that step to better your life and stop living in a world of misery. There is a better tomorrow!! Good men are real... Happiness does exist.. and love isn't supposed to hurt.. Thank you for sharing your story. It is an inspiration to others that life can get better. And that we can overcome the abuse that was done to us. I really needed to hear your story today. It gives me hope to keep going. Thank you and God bless. I am glad God blessed you with a man who treats you and your children how you deserve. This is inspiring for women, like myself, who went through abusive relationships and are still not sure if there is someone for them out there. Getting back to dating has been a struggle for me. Thank you for sharing.